Safflower Oil is a flavourless, colourless oil that can be used for cooking food in, or as an ingredient in salad dressings, baked goods, etc. It is made from the seeds of safflower flowers. It is also light in body, so it clings well to salad vegetables. Commercially, it is used a great deal to make margarine from. In Japan, fancy tins of safflower oil are given as gifts. The Safflower Plant is a member of the thistle family. Above ground it can grow up to 4 feet tall (1.2 metres.) Below ground, it will produce a taproot that can go down as far as 12 feet (3.5 metres.) It produces flowers that can be yellow, gold or orange. The seeds from the flowers are used to make the oil. The seeds are small, about the size of a barley kernel. They are white or cream coloured generally, though the seed hulls may be striped. Refined Safflower Oil has a very high smoke point (up to 450F / 232C.) Unrefined Safflower Oil will smoke at 225F / 107C. Safflower Oil is very low in saturated fat. It lacks, however, the vitamin E that many other oils have, and is outclassed by other oils such as canola which have a higher level of monounsaturated fat, while safflower has a higher level of polyunsaturated. Safflower oils advertised as “high-oleric” have higher monounsaturates levels than other safflower oils. 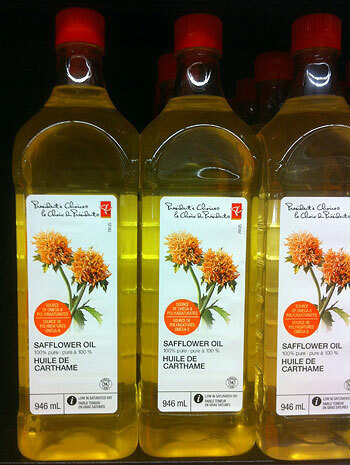 Safflower oil goes stale quickly owing to high level of polyunsaturated fats. Store refrigerated if you use it infrequently and have the space or if not, in a cool place. Stays liquid when chilled. The safflower plant probably originated in the Euphrates basin. It was being grown as a crop in Egypt as early as 2000 BC. Arab traders introduced the seed into Ethiopia, north Africa, east Africa, and Spain. From the Middle East, it spread into Afghanistan, and then from there into India and China by about 100 BC. It reached Japan in the third century AD. By the 1500s, it was being grown in Europe. Until the 1920s, safflower was mostly used as either a colorant (as a food coloring or to make dye stuff from), cosmetic uses, an industrial oil, or some limited medical uses. As a food colouring, it could act as a replacement for the more expensive saffron. Use of the oil for edible purposes was not entirely unknown, however. In 1925, the United States Department of Agriculture (USDA) began 10 years of trials at various agricultural experiment stations, using seed from Russia and India. In 1935, they concluded that the plant had potential in parts of America as an edible oil seed crop. It was only in the 1940s though that further work was taken up. In 1941, the University of Nebraska employed Dr. Carl E. Claassen to evaluate crops that could be useful in that state. He decided to focus on safflower, and through his breeding and selection work, he found that strains of safflower from Sudan and Egypt had superior oil content (33 to 37%) to those strains the USDA had used (which had 22–29% oil content.) By 1949, Claassen left the university to go into business selling and promoting safflower seed. In the 1950s, Japan emerged as a major market for edible safflower oil, as safflower seed from America was allowed into Japan duty-free. Until 1962, most of the oil produced from the seed (about 95% of it) was used industrially for paint and varnish, etc. The problem with safflower oil was that its high level of polyunsaturates caused it to be unstable and therefore require extra processing to remove them. In the 1960s, new bases for paints that were more stable were developed from petroluem. This cut into the industrial market for safflower oil, causing producers to look more to the consumer market for edible oil. In 1961, the book “Calories Don’t Count” was published. The book advocated daily capsules of safflower oil, citing emerging research that was showing that the polyunsaturates in the oil would lower cholesterol for many people. This book and research helped to solidify the market for safflower oil for home food use. In 1957, a safflower mutation was discovered that was higher in monounsaturates, and therefore more stable. It is now known as “oleic safflower”, and is used in products such as mayonnaise, baby formula, etc. In April 2012, the Commonwealth Scientific and Industrial Research Organisation (CSIRO) in Australia announced it had bred a new variety of safflower in which the polyunsaturates level was reduced to 3%, making it suitable to replace petroleum-based oils in some industrial products such as lubricants, fluids. etc. Safflower seed grown in Canada is largely used for bird feed. Dean, Tim. New crop could transform Australian bioeconomy. Melbourne, Australia : Australian Life Scientist. 27 April 2012. Smith, Joseph. Safflower Oil. Chapter 11 in: Shahidi, Fereidoon. Editor. Bailey’s Industrial Oil and Fat Products. Sixth Edition, Volume 2: Edible Oil and Fat Products. John Wiley & Sons. 2005.